By now, you’ve probably heard all about the Low Stress Handling® Certification Program. You know it’s got these videos you can watch that are… maybe all lectures or something? There might be books involved, but you know it exists. So, what is it, exactly? This logo signifies that the people you are dealing with have spent a lot of time learning Dr. Sophia Yin’s methods for reducing stress in animals. They know how to hold a leash, how to offer treats and counter-condition animals to willingly accept medical treatment, and the perfect way to do a medical wrap. What does that mean to you? Simple: a more pleasant experience at the vet’s and a happier pet. It also means that they can use methods that can reduce the need for sedation first, reducing risk and pet health costs. It means you can trust that person to treat your pet like you’d want them to be treated. With skill, professionalism, and care. Whether you see this on a certificate or a nametag, it says good things about how your pet will be treated and that gives you peace of mind. Low Stress Handling® covers every circumstance you need it to. 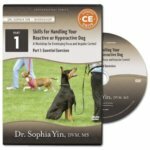 Whether you want to know about walking techniques that work in stressful environments, multiple uses for towel wraps, or effective counter-conditioning for medical procedures, you can find practical learning here. Low Stress Handling® teaches you to understand not just the body language of fear and anxiety in dogs & cats, it teaches you how to resolve the fears an animal has. You can see the problem and do something about it, so you can provide care without worry of harm to you or the animal. Everything you learn is applicable for dogs, cats, gerbils, horses, chicken, ostriches, giraffes and beyond. Providing diagnostic care may not seem to be as focused on handling as a veterinary technician’s work, but the approach you use can determine whether or not you have an easy time with an exam, or a hard time. In fact, knowing how to handle patients in a Low Stress way can determine whether or not you have a one-time patient or a long term client. A vet who knows how to handle their patients in a calm, gentle manner is a vet who will earn the goodwill and loyalty of their clientele. A parent wouldn’t be ok with a pediatrician who grabs their child roughly, yells at them and struggles with them to take a shot. Why would a pet parent be any different? You’ll be able to oversee handling in your clinic and make sure everyone is doing it right. A vet who remains calm and leads his or her team with a view that patient comfort is the utmost concern of his practice will develop the word of mouth that keeps their business successful. So if you’ve been wondering what all this “Low Stress Handling®” is, what those certificates and badges mean, and how it benefits you, hopefully this answers your questions. If there’s any more you’d like to learn about Low Stress Handling® and Low Stress Handling® Certification, check out our “Why Low Stress Handling®” page. For hospital certifications, please email please email us or use the contact form.